Republished September 19, 2013 to correct an error in the text. During the week of September 9, the North Caspian Operating Company, led by Italian oil company Eni, reported starting production from Kashagan, the largest oil field to be discovered in the past 35 years. Since the field's discovery in June 2000, this consortium, including its four original members (Eni, Shell, Total, and ExxonMobil), has invested more than $40 billion in the project in attempts to overcome technical, political, and geographical challenges, making Kashagan not only the largest oilfield outside the Middle East, but also one of the world's most expensive. The recent start of the first of the 20 production wells included in the first phase of production comes eight years later than originally anticipated. This start was in advance of an October 2013 deadline set in the terms of the consortium's production sharing agreement (PSA). Had this deadline not been met, the consortium would have had to forfeit compensation for expenditures. Eni forecasts output from the initial development to reach 180,000 barrels per day (bbl/d) by the end of 2013 and then rise to the full phase-one target of 370,000 bbl/d in 2014. Starting additional wells and meeting or approaching these targets will validate last week's achievement. 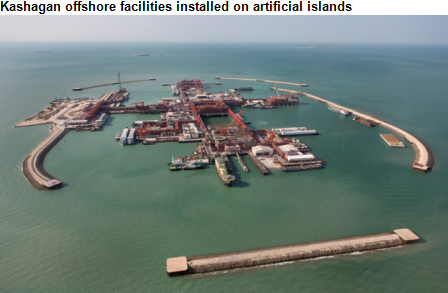 Kashagan is an extremely complex project. Challenges to production include the field's great depth (15,000 feet below the sea bed), reservoir pressure exceeding 10,000 pounds per square inch with lethal levels of hydrogen sulfide, and cold temperatures that make it unsuitable for typical fixed or floating drilling platform designs. Many of the participants have developed expertise in managing projects in remote cold areas, but few have managed projects with so many technical challenges. Kashagan has an estimated 13 billion barrels of oil in proved reserves. This represents most of Kazakhstan's offshore proved oil reserves and is roughly equivalent to Brazil's entire proved oil reserves, both onshore and offshore. A possible second phase would boost production to 1.5 million bbl/d. However, the partners will need to determine if they will be able to recoup their expenses and reach an acceptable level of profitability before the project's PSA terminates in 2041. 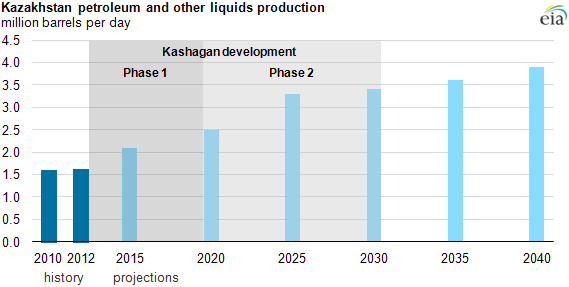 Kashagan and Tengiz, Kazakhstan's largest onshore field, together account for a significant part of nearly 4 million bbl/d of oil production that EIA's 2013 International Energy Outlook projects Kazakhstan will reach in 2040. Because Kashagan is located in the northern section of the landlocked Caspian Sea, bringing oil from the field to market also presents significant logistical hurdles. As many of the production group members are also part of the Caspian Pipeline Consortium (CPC) and have rights along the pipeline of the same name, the CPC may be the likeliest route for the early oil. Pipelines would bring the oil to the Russian port of Novorossiysk on the Black Sea, from where it could then reach international markets through the Bosporus Strait. Kazakhstan also plans on constructing the Kazakhstan-Caspian Transportation System (KCTS) with the help of foreign investment. The plan is to export oil produced primarily at Kashagan and Tengiz to international markets via a new pipeline on the eastern side of the Caspian to a new terminal at Kuryk, before being shipped to Baku to enter the Baku-Tbilisi-Ceyhan (BTC) pipeline. KCTS is expected to supply 300,000 bbl/d through BTC to global markets, gradually increasing to 800,000 bbl/d. Costs for the new pipeline are currently estimated by KazMunaiGas to be $4 billion. A previous TIE discusses in more detail new Caspian oil and natural gas export capacity currently in development. 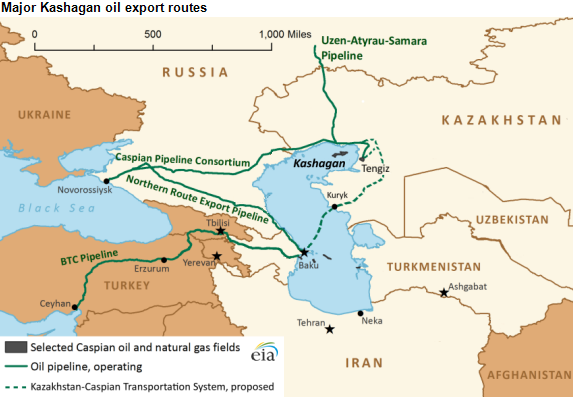 For more information on issues facing the oil and natural gas industry in the region, see EIA's regional analysis brief on the Caspian Sea.